The goal of this post is to give some more details on the workload distribution which we compared to cars waiting for the green traffic light in our previous post. As we wrote, the first thing is to know what time do you have to process all tasks. Let’s imagine that you have one day to perform 10 different tasks. Now, you engage 3 employees in the processing of these tasks. We know that usually, each task needs different time to be completed. Now you define how much time each employee needs for every single task. This we do on a base of the historical data or on a judgment. For the proper distribution of the tasks between employees, you should combine tasks for each employee based on their complexity so the total time for all tasks of an employee to be equal to the total time that you have for completion of all tasks. In the following simple chart, you can see that this distribution is almost the same as the pictures of the cars from our previous post. Having 8 hours working time means that each employee should also have 8 hours total time to finish all tasks. All employees need to work simultaneously. The main difference with the cars example is that some of the tasks could require a longer time for processing than the others. At the end having the information about the times is essential. 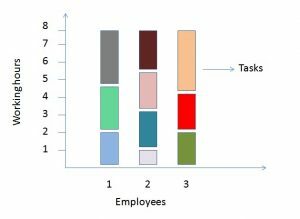 In addition, there is one more thing – in the chart above we have a simple example, not showing a difference in the employees’ capabilities while in regular business, a significant impact has the factor of skills and knowledge variance of the employees. You have to take into consideration this variance to predict what the actual times of processing will be. What is this variance, how to measure it and to eliminate its effect? You will find in some of the next posts. ← Do you know that the office workload wrong distribution and cars waiting for the green traffic light are the same issues?